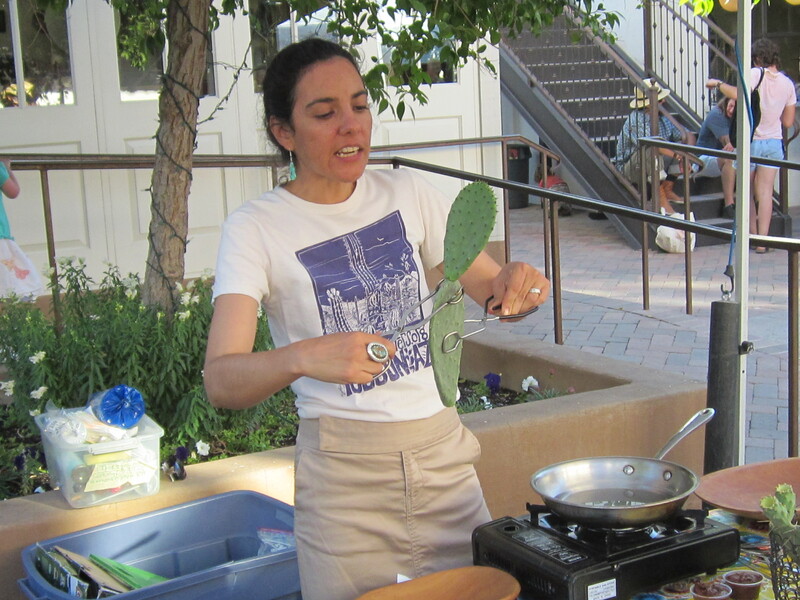 Amy Valdez Schwem discusses nopales at the Tucson Downtown Mercado. Prickly pear cactus of all species are currently putting out their new leaves and there is more than one way to turn them into something good to eat. 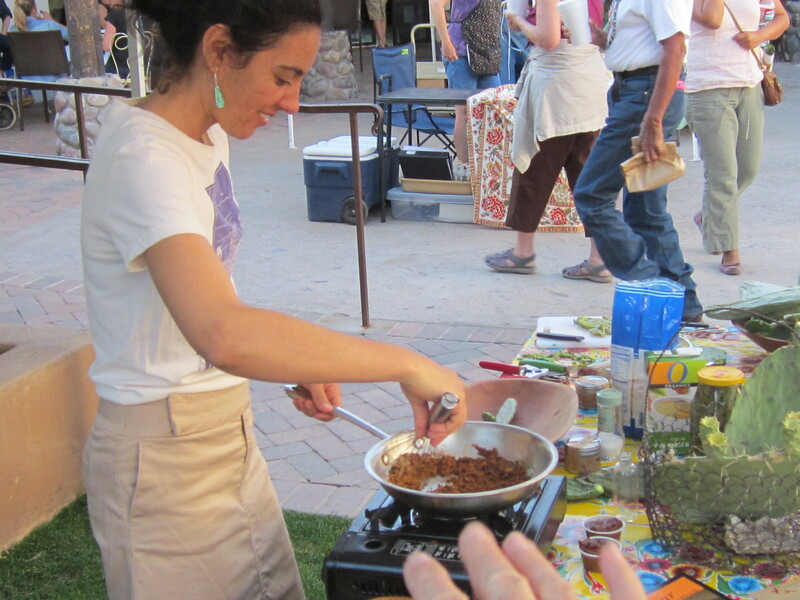 Recently Amy Valdés Schwemm demonstrated her method at the Tucson Mercacdo farmer’s market. No surprise, she does things a little differently than I do. 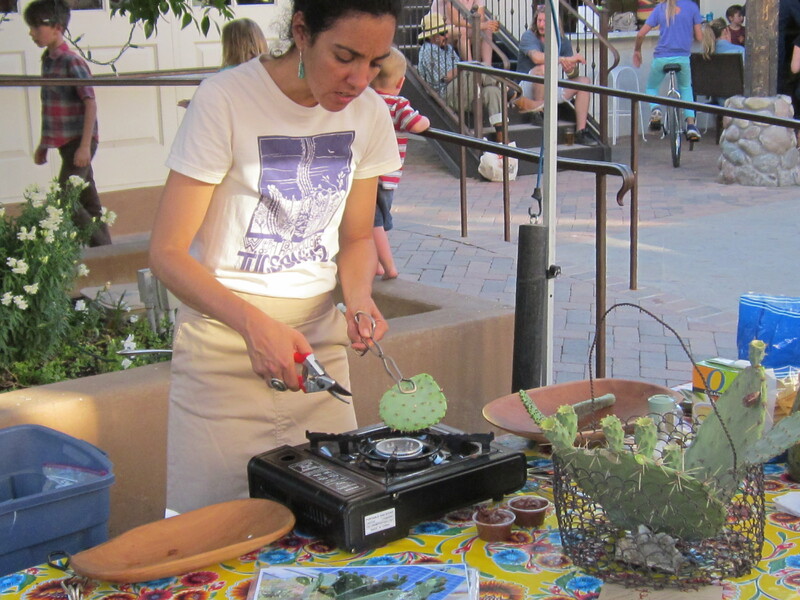 She was demonstrating on pads from the big Mexican cactus called Ficus indica. The variety doesn’t grow wild in Arizona but is prevalent in many yards. 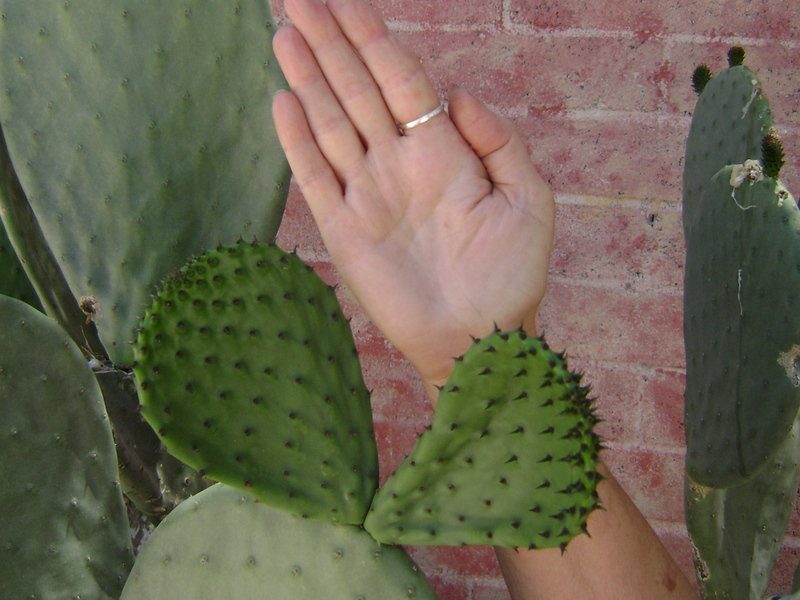 Pick the new cactus pads when they are about the side of your hand. Amy begins by burning off some of the stickers over a flame, then cuts out the remaining thorns one by one. I go after them more vigorously and scrape the surface of the pad. Amy using tongs to burn off stickers. Next Amy cooks the pads whole in a little oil turning with tongs. I’ve always cut my nopales into little pieces (nopalitos) first, but this may be a better method as you don’t have to flip all the individual bits. After the pad is cooked, Amy then cuts it into nopalitos. 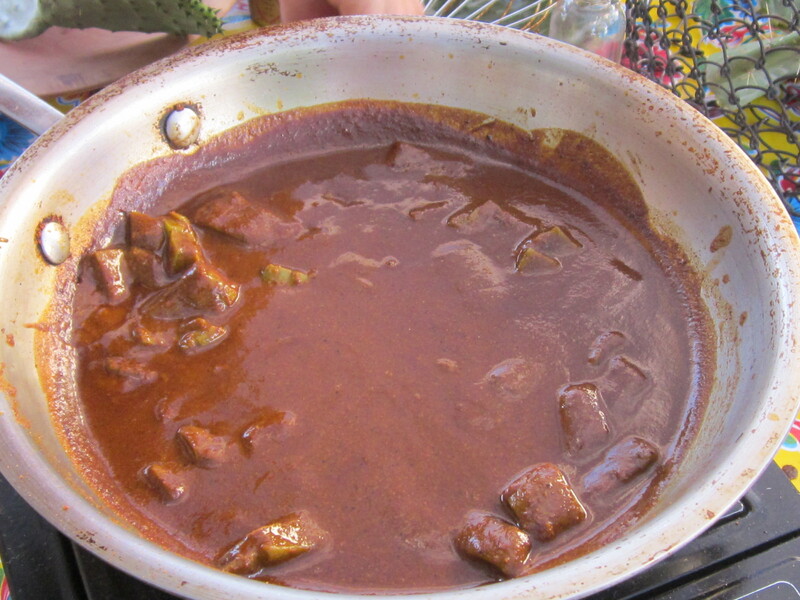 Amy prepares the sauce from one of her mole mixes. 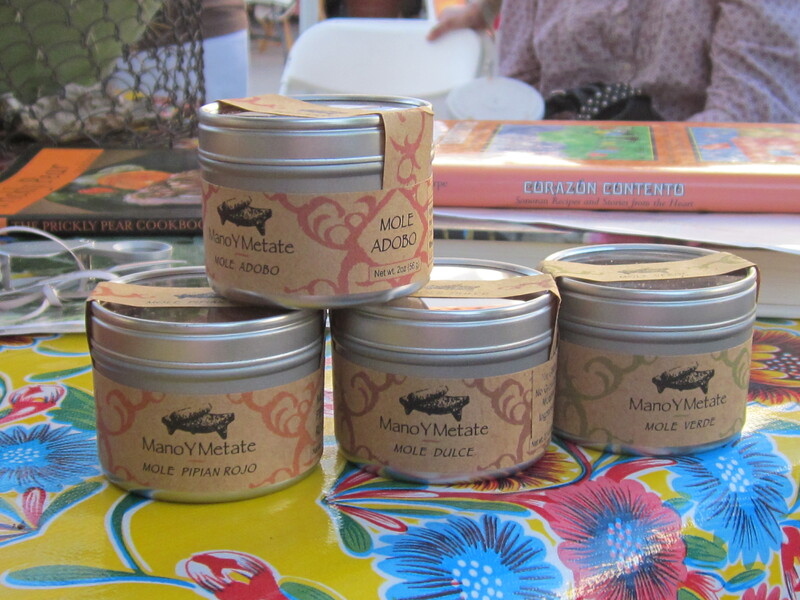 Amy prepared a sauce for the nopalitos from one of her delicious signature Mano y Metate mole mixes. This sauce goes well with the cooked nopalitos and the sap from the nopalitos helps to thicken the sauce. A selection of Amy’s mole mixes. During Amy’s presentation I also learned another surprising fact about nopalitos. They freeze nicely (I’ve been discouraging my students from freezing them, assuming that the cell walls would collapse). Also attending Amy’s presentation was Matts Myhrman, a friend from decades ago when we were younger and used to gather to share information at The Tepary Burrito Society. Matts brought some nopalitos he had prepared from an abundant crop of cow tongue prickly pear. He had more than he could eat and froze some. Once defrosted, the nopalitos had lost some crispness but would be perfect for including in a sauce. Even more amazing, they were not at all slimey. If you have a yard full of prickly pear pads and are wondering about some ideas for what to do with them, check out my cookbooks Cooking the Wild Southwest, Delicious Recipes for Desert Plants. and the Prickly Pear Cookbook. For inspiration and directions on what wild plants are available in what season, watch a short video here.